This question is probably one of the most common questions that adopted children ask at some point in their lives. The feelings of insecurity can crop up at the most unexpected moments and leave them filled with questions. At nine years old, my oldest child has been asking those questions for years. And now my six-year-old is chiming in. Where did we come from? What is our birth mom like? Who is my birth dad? Do you think I’ll be tall? Why do I look this way? Do you think anyone else in my family has skin like mine (from my eczema-challenged child)? Unfortunately, there are more questions than answers, and sometimes I just have to tell them that I don’t know. It becomes even more obvious at doctor’s appointments when we are trying to nail down why certain issues crop up or when puberty will hit or whether we should be looking for certain medical issues. I know that I’m not the only adoptive parent to struggle with this. 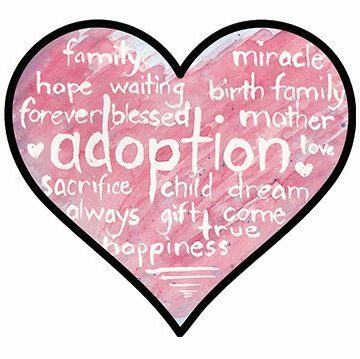 The truth is that while adoption is wonderful, it always comes at a cost. And sometimes that cost involves losing part of their identity. It can be difficult to not know things about your own medical history or family tree. But when these insecurities crop up, there are things that we parents can do to reassure our children. 1. Remind them Who does know them! “Before I formed you in the womb I knew you, and before you were born I consecrated you…” (Jer. 1:5). The best security we can give our children is to remind them who they are in Christ. No matter how much we love our children, we will never love them as much as the One who created them! God has a plan for each one of us, and we don’t need to know our DNA in order to fulfill His purpose for us. Some day, they may find out their family history or they may not. But we need to constantly remind them that what matters is that they know who their God is. He’ll take care of the rest. 2. Remind them of who they are to you. Maybe you don’t have all the answers, but you do know everything about their life from the moment you became their parent. Don’t hide their adoption story from them! Share the journey you went through to become their parent! Go back over old photographs together, reminisce about the moment you were matched with them, and remind them of their special role in your family. They want to know their own story, and you can tell them everything you do know. 3. Identify the unique qualities that they possess. All children, whether they are adopted or not, struggle at some point with their identity. The best thing we can do as their parents is to help them see the wonderful qualities that make them special! Are they musically talented? Artistic? Great in science or math? A writer? A good friend? What do you see them doing well? They need to hear that they have wonderful qualities, so make sure to tell them! I praise You, for I am fearfully and wonderfully made. Wonderful are Your works; my soul knows it very well – Ps. 139:14. 4. Remind them who you are. This may seem like something they should already know; but when a child is looking for answers about their biological parents, they need to know that they can always come back to the parents who love them and have been raising them. They need to know that it’s okay for them to ask questions because they are secure in the fact that you are always there for them. Don’t make them feel bad that they want to ask about their heritage. It has nothing to do with you or their love for you. It has only to do with them and wanting to know everything they can about themselves. There is no fear in love, but perfect love casts out fear. For fear has to do with punishment, and whoever fears has not been perfected in love – I Jn. 4:18. It’s only natural for your child to want to know who they are. So tell them. It’s our job as parents to help them as they navigate these growing up years. As adoptive parents, we may face some extra unknowns, but our role is the same–to love them and help them to grow secure in who they are.